Former Philadelphia Eagles general manager Tom Heckert. Tom Heckert, the former general manager of the Philadelphia Eagles during one of the team's most successful eras, died Sunday night at the age of 51. 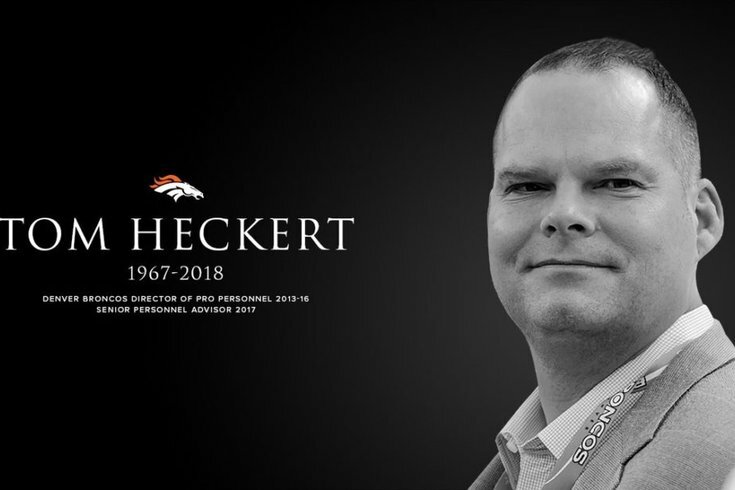 Heckert had most recently been working as a personnel executive with the Denver Broncos when he stepped down at the end of last season due to complications from amyloidosis. How many future Hall of Famers are on the Eagles' current roster? Eagles fans remember Heckert as a rising front office figure during the team's resurgence in the early to mid 2000's, when he served alongside Andy Reid and Joe Banner. He was in Philadelphia for five NFC Championship Game appearances and Super Bowl XXXIX, assuming the general manager role in 2006. Heckert left the Eagles in 2010 to serve as general manager of the Cleveland Browns and eventually joined the Broncos, where he was part of the team that won Super Bowl 50. Executive Vice President of Football Operations Howie Roseman issued a separate statement. Heckert, a father of two, was born in Youngstown, Ohio, and attended Hillsdale College in Michigan. He was the son of former Miami Dolphins personnel executive Tom Heckert, Sr. and began his NFL career in Miami in 1991.